I’ve been mostly working on making earrings for the past couple of days. 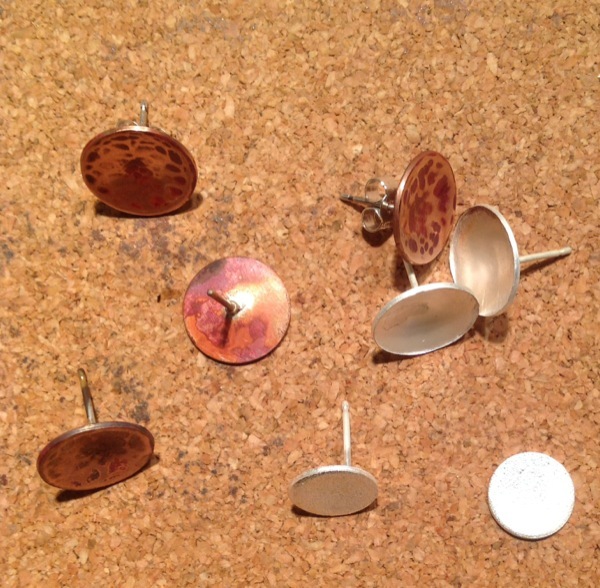 Specifically post earrings, some in silver, and some in copper. As you can see from the photo, they are works in progress, and at different stages of completeness. I do like making earrings, but the soldering of the posts can be a bit of a trial. It’s incredibly fiddly. Sometimes they work first time, sometimes it takes a few goes. The most annoying thing is when your tiny square of solder ‘pings’ out of position as you heat it, and flies across the room. That’s real count to ten and curse under your breath time. These mostly just need a bit of polishing to finish them off, except for the one in the bottom right of the photo. I have so far failed to solder a post to the back of this one, much to my annoyance. I had to leave it in the end today, and go out for a walk to clear my head, but tomorrow it will be getting a post soldered to it, whether it likes it or not!